Follow us on Facebook & Instagram to see our latest photos! The Ultimate Whitewater Trips on the Salmon River! High Country Expeditions offers one, two, and three day trips on this river. Generally, the first day of multi-day trips is on the lower run flowing through a magnificent gorge with waterfalls gracing the marbled granite cliffs. This run starts with class III and IV rapids preparing us for the highlight, class IV+ Gaping Maw. This lower section is filled with plenty of exciting whitewater, but is only just a prelude of what’s to come on the infamous Nordheimer Gorge upriver. The upper run through the Nordheimer Gorge (the second day of multi-day trips) is a continuum of raftable waterfalls with long turbulent rapids, somersaulting waves, enormous sucking holes, and plenty of boulders to maneuver around. The run begins immediately with class IV+ rapids such as Bloomer’s Falls, Lewis Creek Falls, and Airplane Turn. Along the way you’ll also be challenged with the rapids Achilles Heel and Whirling Dervish. The thrills continue with the class IV+ Cascade Falls, Last Chance, and the grand finale of class V Freight Train. High Country Expeditions does recommend previous paddling experience. Although this river may seem extremely challenging, it is very family friendly. With the various choices of river sections to raft, the California Salmon River does have something for everyone! We do have a 14 yr age requirement on the California Salmon, but you are offered a choice when it comes to which section to raft, from a class 2-3 section, to a class 3-4 section or the class 5 section. The class 5 section over the years has been downgraded by our guides due to the number of trips they have guided there. Your guides may also decide on which river section to raft depending on a variety of factors such as; the water levels, weather, client group make up and such. As always safety and your enjoyment are our number one concern on every excursion! Our trips are conducted on paddle rafts, as well as stern assist paddle raft configurations. Californias best whitewater rafting trips on the California Salmon River. 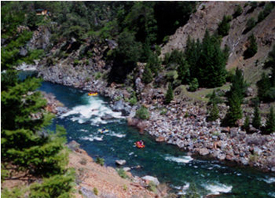 Class 5 Whitewater Rafting on Californias Salmon River, Oregon's best Whitewater Rafting!! A minimum 50% deposit or credit card is required to secure a reservation, unless other arrangements have been made. For groups of 12 or more payment is due in full 48 days prior to your trip. After making your reservation, confirmation will be sent out with any additional information you may request. Last minute inquiries are welcome, please give us a call and we will do our best to accommodate you! We accept cash, checks, Visa, MasterCard and Discover. Prices are subject to change without notice. You may cancel your trip 30 days prior to the trip date for a full refund. Cancellations made 29 to 3 days prior to your scheduled trip will result in a $25.00 reservation fee, and a $100.00 per person fee for extended excursions. The balance will promptly be credited back to your credit card. Or, if you would like to reschedule your trip for later in the season, we will work with you to do this and apply the deposit amount to your new trip. We do not offer any refunds after your trip has been rescheduled. Sorry, but no refunds for cancellations made 48 hours or less from the trip date. If you schedule a trip for a group of 20 or more, you may finalize the number of people in your group a week before your trip without penalty. As always, we want to make sure you are happy, and will always work with you to achieve this. We reserve the right to cancel any excursions due to unsafe water conditions, poor weather, and other circumstances beyond our control. If a trip is cancelled, you may choose to reschedule or we will promptly refund your deposit/payment in full. Cancellation for schools: You may cancel your enrollment 14 days prior to the date for a full refund with a $50.00 filling and holding fee. Cancellations made 13 to 6 days prior to your scheduled trip will result in a none refund of deposit, any balance will be returned promptly. Sorry, but no refunds for cancellations made within five days of the start of the course.